Tributes were paid to 12th century saint philosopher Basaveshwara and architect of the Indian Constitution Dr B R Ambedkar on their birthday anniversaries to mark the occasion as an anti-discrimination day in London on Sunday (14) . India’s high commissioner to the UK Ruchi Ghanashyam and deputy high commissioner Charanjeet Singh paid tributes at the Albert Embankment to Basaveshwara and Ambedkar on their 885th and 128th birthday anniversaries respectively. Speaking on the occasion, Patil said: “We are paying tributes to both Basaveshwara and Ambedkar jointly because both share a conceptual relationship. Both opposed caste discrimination and gender inequality”. 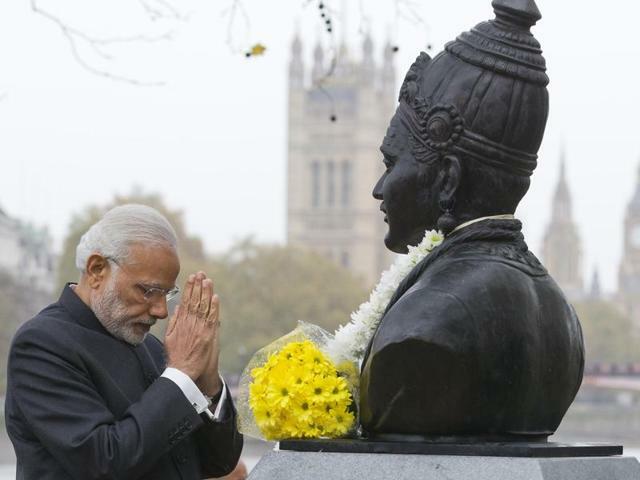 On November 14, 2015, India prime minister Narendra Modi simultaneously unveiled the statue of Basaveshwara and Ambedkar house in London.